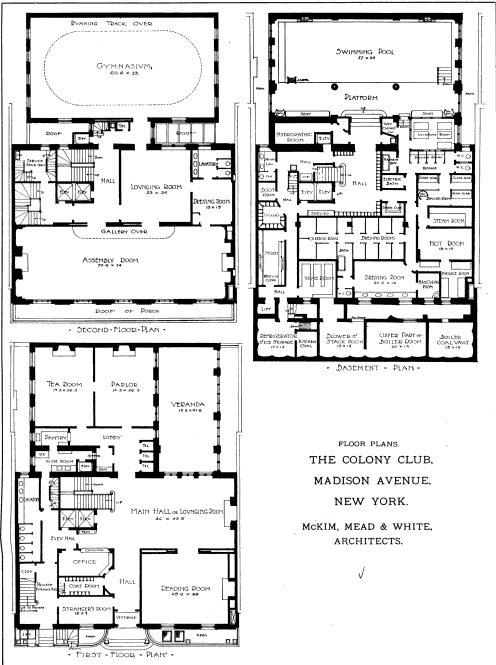 The Colony Club designed by McKim, Mead & White c. 1907 at 120 Madison Avenue at East 30th Street in New York City. 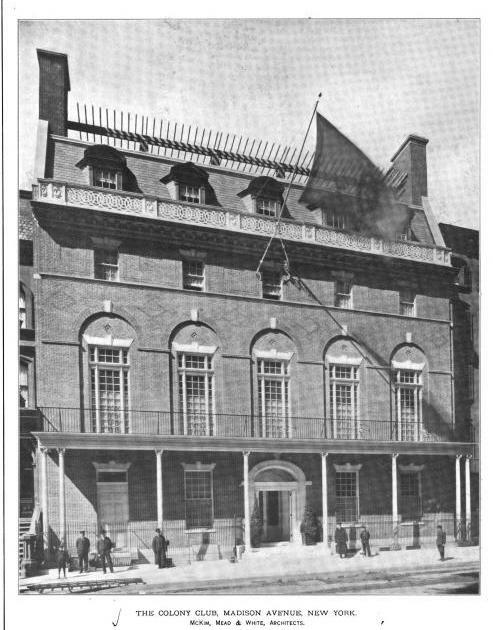 In 1916 the club moved to a Delano & Aldrich designed building at Park Avenue and East 62nd Street and the original building is now the American Academy of Dramatic Arts. Click HERE for more on the Colony Club and HERE for Christopher Gray's Streetscapes article on the building. Click HERE to see the building on google street view. Pictures from The Brickbuilder, 1907. I love MM&W and probably all of their work in general, but that is one disorganized and confusing floor plan. The symmetrical facade hides a maze of rooms and services. 1) The general problem of how to design a Women's Club, which hadn't been done before. Is it just a men's club with different bathroom fixtures? Or is it something very different? 2) There were, as I recall, at least three strong-willed women with deep pockets who almost certainly had ideas of their own. 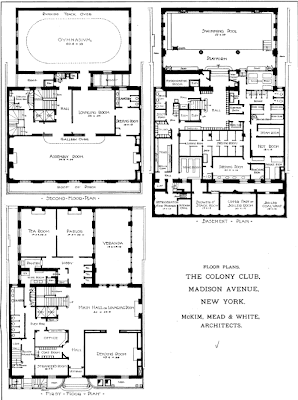 Archibuff, are we looking at the same floor plans? I see strong axial arrangement of the two main floors, a decent hierarchy of spaces according to function, and the expected arrangements for behind the scenes serices. Stairs are well located, and the path to all function rooms is clear and obvious. For a club, one thinks small hotel more than residential. The locker rooms, etc. in the basement are arranged no better or worse than such spaces at my gym, and again, with an eye to priacy. The old pergola on the rooftop seems vaguely out of place. And I wonder how often the ladies used the space. Wine room? Maybe the strangers waiting in the "strangers room" could bring wine in with them? So this morning I rubbed my eyes and yep, I still say its a confusing mess. Poorly organized floor plans, circulation and crowd control. Sure some windows and door openings line up on axis but thats design 101. Imagine the Assembly room letting out and a 150 or 200 women jammed into the 2nd floor corridor waiting for the elevator and stairs (BTW a disasterous decision to locate them side by side were there is always crowding) then women congregating on the main floor infront of the main office counter & coat room, also blocking the main hall and people trying to pass them to get to the bathrooms located behind the stairs. Poorly thought out circulation and a mess. IMO. And are those lockers out in the main hall of the basement? Ughh. I have been lucky enough to be in the Union Club by D&A off Park Ave and it has incredible circulation, room layouts and makes this interior plan look amateurish and I love MM&W, but this interior is a mess. Yes, and just how much bigger is The Union Club? Ah but good design, circulation and proportions should be evident in any building plan, especially one created at the hands of a master firm. I took a long look at the exterior the other day, and thought, It's past time to call the painters.